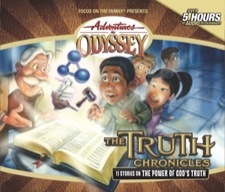 Designed to explain Christian worldview to younger kids and teach them how to make it a part of their lives, this special set features 11 all-new episodes… including 8 stories never before aired on the Adventures in Odyssey broadcast! Are there really right answers to big questions about God, faith and truth? How can you best explain intelligent design? Will Captain Absolutely triumph over the evil schemes of Dr. Relative? And what happens when kids are in charge of their own city—with no adults? There’s absolute adventure ahead with these life-changing stories on seeing the world from a Christian perspective—and that’s no lie.